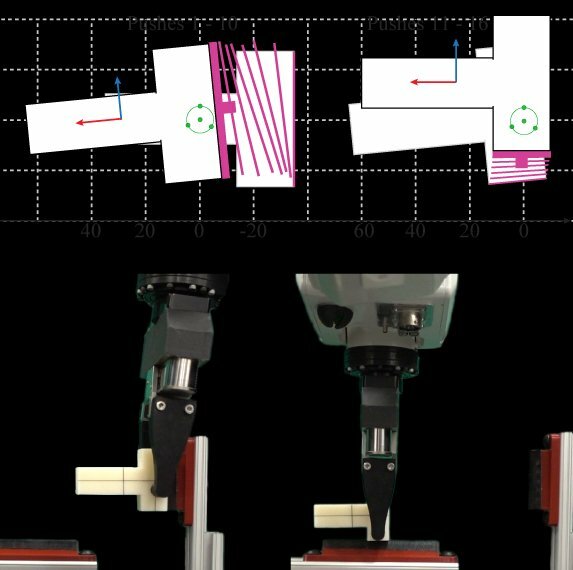 This paper presents an approach to in-hand manipulation planning that exploits the mechanics of alternating sticking contact. Particularly, we consider the problem of manipulating a grasped object using external pushes for which the pusher sticks to the object. Given the physical properties of the object, frictional coefficients at contacts and a desired regrasp on the object, we propose a sampling-based planning framework that builds a pushing strategy concatenating different feasible stable pushes to achieve the desired regrasp. An efficient dynamics formulation allows us to plan in-hand manipulations 100-1000 times faster than our previous work which builds upon a complementarity formulation. Experimental observations for the generated plans show that the object precisely moves in the grasp as expected by the planner. In-hand manipulation using external pushes for which the pusher sticks to the object. We present an efficient dynamics formulation of prehensile pushing and its application in a sampling-based planning framework. The planner generates pushing strategies, involving pusher switch-overs if necessary, in a few seconds.